This 3D pumpkin cake is a fun Halloween dessert. While most decorated pumpkin cake tutorials are targeted towards the experienced cake decorator, this one is not. It doe not require any special decorating equipment or tools and most of the candy used to give the pumpkin character can be found at the grocery store. This recipe calls for boxed yellow cake mix but to keep with the pumpkin theme, you can certainly make a pumpkin cake instead. 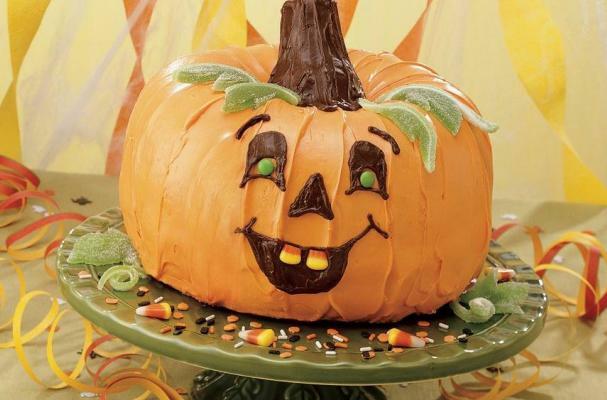 You will have a blast baking this cute pumpkin cake. Heat oven to 350°F (325°F for dark or nonstick pan). Grease and lightly flour 12-cup fluted tube cake pan, or spray with baking spray with flour. Make, bake and cool 1 cake mix as directed on box for 12-cup fluted tube pan. Repeat with second cake mix. Stir 1/4 teaspoon of the orange paste icing color into each container of vanilla frosting. To make pumpkin shape, place 1 cake, rounded side down, on serving plate (if necessary, trim cakes to form flat surfaces). Spread top with 1/3 cup orange frosting. Place second cake, rounded side up, on top of first cake. Frost both cakes with remaining orange frosting. Frost outside of ice cream cone with 1/3 cup of the chocolate frosting. In small resealable food-storage plastic bag, place remaining chocolate frosting; seal bag. Cut tiny hole in one bottom corner of bag. Squeeze bag to draw eyes, nose and mouth on pumpkin with frosting. Add baking bits for irises of eyes and candy corn for teeth. Insert frosted cone in center of cake to form pumpkin stem. With knife, cut leaf shapes from candy jellies (see photo); place near stem. To serve cake, cut slices from top cake before cutting bottom cake. Store loosely covered.